It’s a 1,200-mile one-way trip from Dayton to Colorado Springs, Colorado. But when Dan Albright found out that the radiation and chemo-therapy treatments he had received for tongue cancer had caused radiation tooth decay, travel distance was no obstacle. In June, 2007 Dan was diagnosed with cancer, located on the back of his tongue. In order to contain the spreading of the disease, this 43-year veteran of the hospitality industry underwent six chemo and 33 radiation treatments. The treatments were successful. “I have now been cancer-free for 11 months,” the former USAF enlistee proudly stated. But the required treatments created what is commonly known as radiation tooth decay. “Now I just consider that stage in my life as a minor setback,” Albright said, while loading his van, preparing for his trip back home. “I have Dr. (Ingrid) Valdez (on-staff dentist at the Denver Veteran’s Administration Hospital) to thank for first discovering the severity of the tooth decay and then setting up the program to be transferred here to Dayton – the VA and the Hyperbaric Center – here at the base. She made it all possible,” he said. “I had no idea what to expect when I first arrived, but the people here (Fisher Nightingale House Compassionate Care Facility), the people at the VA, and the people at the Hyperbaric unit here at Wright-Patt have been, well, let’s just say WELL beyond what I had ever anticipated,” Albright said. For seven weeks this man underwent a number of reconstructive tooth and jaw surgeries, which was accelerated due to the treatments he received at the WPAFB Hyperbaric Oxygen Therapy. HBOT helps promote the healing process for bone and tissue damage. “The therapy forces more oxygen in the tissue, encouraging the formation of new blood vessels. The chamber creates characteristics similar to being 45 feet below sea level. Breathing 100%oxygen under pressure; equaling nearly 30 lbs. per square inch; the affect causes the oxy-gen to diffuse in the blood plasma. The pressurized environment helps to reduce swelling and pain, while providing the body with up to 20 times its normal supply of oxygen to help repair tissue damage,” according to published reports. Patients are placed in an oxygen tank (the facility at WPAFB can hold up to 18 individu-als during one session) and go through a process of three “dives” simulating the below sea level pressures. “It would have taken me two-to-three times longer for the healing process, had I not had gone through the therapy,” he added. 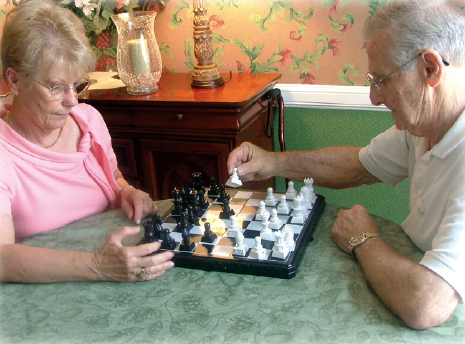 Albright was faced with staying by himself at the VA Housing Facility, but the Fisher-Nightingale Houses at WPAFB provided a facility for him and his wife, Margo. “I feel very blessed,” Albright said. “Not only that they discovered the decay before infection occurred and possibly losing my jaw bone; but especially because they found this unbelievable facility where we were able to stay,” he triumphantly stated, motioning with his hands, sitting in the dining room at the Fisher House. “There’s so much more to the healing process; it goes beyond the physical. And when your mental well-being is also cared for, well, let me just say that my wife and I now consider this facility our second home,” he said in a quieted tone. “When we first walked into the Fisher House, our mouths dropped open,” Albright said of his welcome to Dayton, WPAFB, and the compassionate care facility. “Being in the hospitality business for most of my life, I know what to look for and understand the challenges of maintaining an operation like this. Let me tell you, this place is immaculate,” he added. “You could not have a more relaxing place, unless it was your own home,” the Colorado Springs resident said of the center. He and his wife recalled that after a full day of surgery they “returned ‘home’ to find a throw (cover) at their door,” welcoming them back from the VA. “You wonder about something that you might need and the next thing you know, it’s there, in your room,” his wife, Margo added. “People bringing in meals; volunteering to help out; and a staff that bends over back-wards, just to make certain you are healing emotionally and physically. I even told Margo how wonderful it would have been to have had a staff like this,” the retired hotel manager said. “When you’re going through surgery and treatment – the illness is tough – but this facility and the people make you feel a thousand times better than you probably really feel,” Albright said. The seven-week ‘residents’ of the Fisher-Nightingale House repeated what so many have voiced; that few realize the existence and the importance of the compassionate care facility. “It needs to be shouted from the rooftops. We need a facility like this at every military installation worldwide,” Albright said.